Oxidizing substances cause or enhance the combustion of another material, generally by yielding oxygen. For this reason, the classification of oxidizers for their relative oxidative strength is important for understanding the safety aspects of handling, storing, and shipping these oxidizers. The UN Model Regulations assigns Division 5.1 for oxidizing substances. Classification is assigned for liquid oxidizers by performing UN Test O.2, Test for Oxidizing Liquids, from the UN Manual of Tests and Criteria. In this test, the oxidizing strength of the test sample is compared to 3 standard materials. If the material is a Division 5.1 Oxidizer, it is then assigned a Packing Group relative to the 3 standard materials. 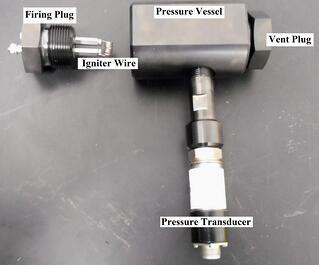 The test setup consists of a pressure vessel, pressure transducer, vent plug, igniter wire and firing plug. At the start of the test, an igniter wire is wound and attached to the firing plug. The setup is shown in Figure 1. The firing plug is attached to the vessel, along with the pressure transducer. The vessel is charged with the substance to be tested – 5 grams of a 1:1 mixture by mass of the liquid to be tested and cellulose. The vent plug is then attached to the pressure vessel, with a bursting disc with a bursting pressure of approximately 320 psi. The assembled vessel is placed in a support stand at a 60° angle from the horizontal plane. The igniter wire is energized for 60 seconds, or until the rupture disc bursts. 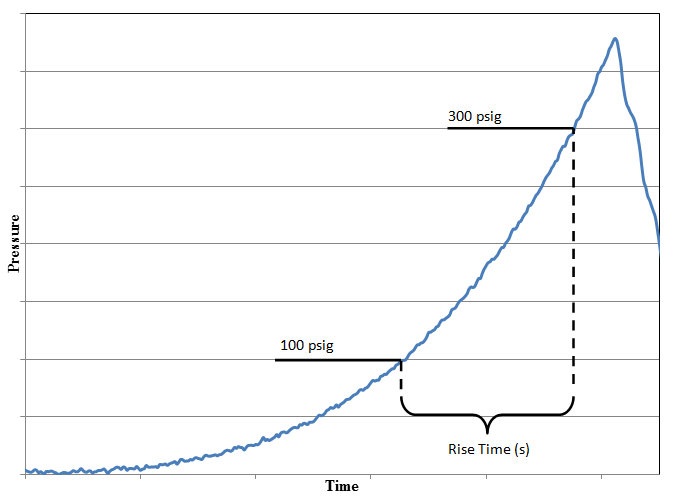 If the disc bursts, the time taken for the pressure rise from 100 psig to 300 psig is noted. A shorter pressure rise time indicates a more energetic reaction and a stronger oxidizer. Five trials are performed, and the mean time interval is used for the classification. A graph of a sample trial is shown in Figure 2. The results from the sample under test are compared with the standard reference liquid oxidizers of 50% perchloric acid, 40% aqueous sodium chlorate and 65% aqueous nitric acid. The mean value from inter-laboratory comparative trials in the UN Manual of Tests and Criteria for 1:1 mixtures of the reference oxidizers are shown in Table 1. Of the 3 standard oxidizers in Table 1, 50% perchloric acid is strongest oxidizer, and 65% aqueous nitric acid is the weakest oxidizer. The Division 5.1 and Packing Group classifications are outlined in Table 2. After determining the packing group for the oxidizer, this information can then be used to properly package and ship your oxidizer material.